Added by Bill Bowman on November 30, 2018. Township Councilman James Vassanella said a proposed “Do Not Knock” ordinance would allow people to opt-out from having door-to-door solicitors at their homes. Ordinances establishing a “Do Not Knock” list for door-to-door vendors and creating four-way stops on Pierce Street were introduced at the Nov. 27 Township Council meeting. 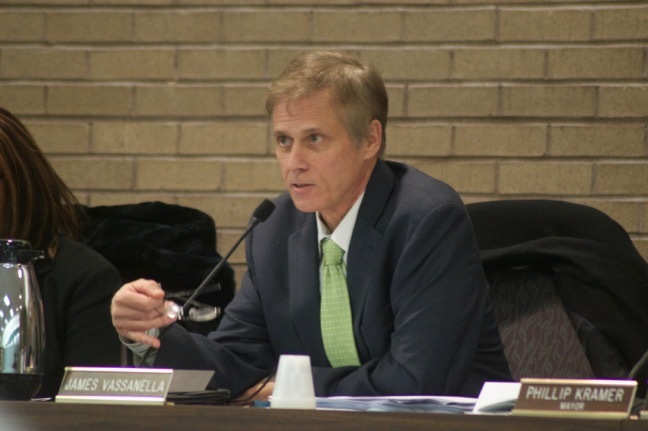 Township Councilman James Vassanella (D-Ward 5) said the “Do Not Knock” ordinance would create a master list of residents who do not wish to be solicited by door-to-door vendors. The list would be given to vendors who want to solicit when they register to do so. “Across the state recently there have been several municipalities that have given people the opportunity to opt out … whatever the reason is, they can sign up on a list and simply the peddler would have that list and would be beholden to not knock on that door and bother the person,” he said. The list would be updated several times a year, he said. The list would not apply to non-profit organizations or religious or political groups, he said. Township Manager Robert Vornlocker said a survey of two intersections on Cottontail Lane, plus overall studies of the intersections, led to the ordinance establishing four-way stops. The intersections affected are Pierce Street and Belmont Avenue and Pierce Street and Cottontail Lane. Township Councilman Will Galtieri (D-Ward 2) said the stops would be a good thing. A second reading and final vote for both ordinances is set for a December meeting.